Many products on the market today claim to be “natural.” But what makes a product natural? Most people have a common-sense definition of what “natural” is or should be. For example, natural to most people means being able to pronounce all the ingredients and not needing a chemistry textbook to understand them. The definition of “Natural” is important. It sets apart socially responsible companies from the rest. Synthetic ingredients can be toxic, and usually cost less than natural ingredients giving the mass-marketed multinational corporations a competitive advantage. The big companies know that the natural organic products market is growing every year and consumers are demanding products that are healthier and better for the environment. These big corporations have jumped on the “natural” bandwagon and cranked up their marketing machines to benefit from green consumerism. Having a loose definition of natural is just what they want. Take a look at the supermarket shelves and you will see the multitude of “natural” claims. Their definition of natural includes manipulated and chemically altered ingredients. To them “natural” is just another marketing gimmick, not a way of life. 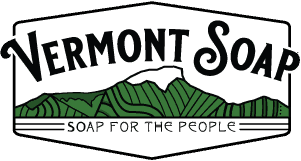 With all of the bogus claims out there, how do we get consumers to realize Vermont Soap Organics products are the real deal? Can any product claim to be natural? The Federal Trade Commission (FTC) is the watchdog for bogus environmental claims. The FTC’s guidance does not address “natural” marketing claims specifically. However, the guidance includes a section on general environmental benefit claims that states, “every express and material implied claim that the general assertion conveys to reasonable consumers about an objective quality, feature or attribute of a product or service must be substantiated.” With so many products on the market claiming to be natural and so few government resources to enforce bogus claims, it is up to consumers to identify what is truly natural. Consumers should carefully read product labels including ingredient lists and then vote for their definition of natural with their buying power! Are synthetics and chemical ingredients safe? Some ingredients in mass-marketed soap including detergent chemicals, artificial fragrances, FD&C Colors, Propylene Glycol and Triclosan, have been proven harmful to mammal health and can cause severe skin irritation in some people. These ingredients are not natural. Some companies will include a trace of truly natural ingredients in a product with some of the synthetic ingredients above and claim the product is natural. Bogus! What does “Natural” mean at Vermont Soap Organics? It means no petrochemical ingredients or artificial fragrances and no testing on animals. It means using herbal concentrates as a preservative, not a chemically-derived formula. Natural is about better choices and the responsibility inherent in those choices: organic before pesticides; botanicals before artificial colors and fragrances; vegetable-based before animal-based; and reusable before disposable. Natural is about big-picture thinking. It’s about socially responsible business, looking at how we source, formulate and package and reuse or safely dispose of what’s left. It’s about the relationship between producer and consumer and the planet that we share. Natural cannot be codified like the ten commandments. It is about staying as close to the original form as possible. Natural is about developing an integrated long-term view of everything that we do. What the heck are we talking about? After all, soap is a chemical compound made from oils, alkali and water. Vermont Soap is concerned that the word “natural”, (originally a counterculture term with a generally understood definition), has been rendered meaningless by its proliferation on the labels of major food corporations. OUR definition of chemical/synthetic free, and the definition we are attempting to imply in the mind of the consumer, is that our products are safe and nontoxic, readily biodegradable, and made as close to original form as possible; that it is free of artificial colors (no FD&C or Lake Colors are used), artificial fragrances (essential oils used instead) or preservatives (we use a high quality rosemary extract – never any EDTA, triclosan, benzoin, parabens, etc. ), detergents, alcohol’s, propylene glycol, etc. We recognize that in the absence of a generally recognized definition of synthetic in personal care, our claim is essentially puffery. One proposed working definition of synthetic (as pertaining to personal care products) is, “a product that cannot be produced in an ordinary American kitchen using generally available utensils”. Handmade bar soaps, castile liquid soap products, essential oils, liquid aloe, rosemary extract, alkali – all of these natural products fit this sensible working definition. NATURAL IS ABOUT YOUR FUTURE! I say, “So with your scientific training, your perception is that everything’s made from molecules, and molecules are found in nature. Therefore, everything is natural! “Certainly!” He exclaims, but stops smiling when he sees the look on my face. “There you have it! That’s the difference between a natural company and the mass-market!” I follow his glance. Across the room a 16-year old is standing by the exit. Protecting the planet and your health comes down to important purchasing decisions. What definition of natural do you support with your buying habits? Contact us on Facebook with your definition of natural.